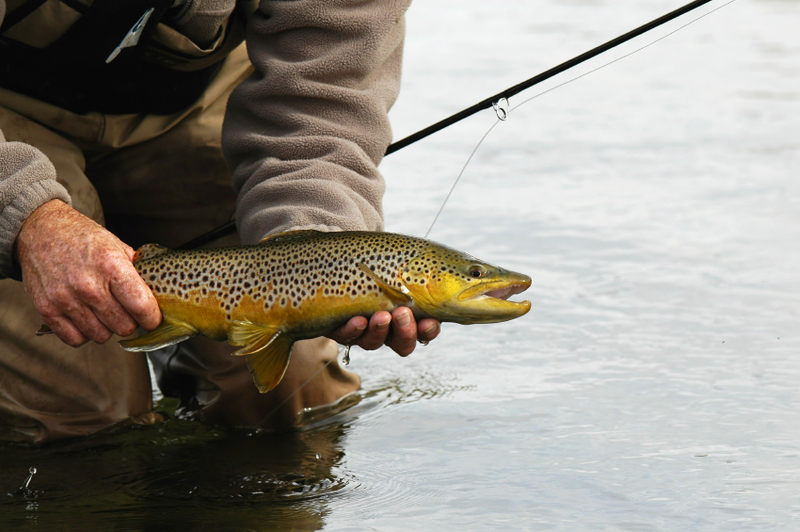 Trout fishing can be an excellent way to spend the day. It’s a great way to get back to nature and to pit yourself against one of the greatest fresh water creatures – a battle of instincts, if you will. But, when you are walking down a stream all day, you don’t want to be carrying a lot of heavy gear. Luckily, there is a great selection of gear aimed at people, like you, who prefer to fish standing in a stream. Of course, you will need a good pair of waders, be they hip boots or chest waders, you’ll want some of good quality with a sole that will help you not lost your footing on the slippery rocks you will find on the bottom of most streams. There are is a huge selection of great waders on the market now, and many of them are very lightweight and are comfortable to wear all day long. It is also advisable to wear a life jacket underneath your waders in case you should fall and your waders fill with water. There are also incredibly light-weight versions of life jackets now, too, including the type that automatically inflate should you go underwater. Next to your waders, the most important piece of clothing will probably be your vest. Many fishing vests come with up to 20 pockets and they can carry as much as a traditional tackle box. The best thing is – you don ’t have to carry the tackle box! Some vests come with padded shoulders and collars to make them more comfortable to wear. A good fishing vest is really important, and it will also lighten your load quite a bit. That will be one less than you have to carry. Good vests will also have a few D-rings on them for you to hang your net or other gear. Rubber mesh nets are best for catch and release and you will find there are a large number of light-weight nets that will clip easily to your vest. You may also want to bring a creel with you if you are going to be keeping your fish. This can be clipped to your vest also. This way, the only thing you have to carry in your hands will be your rod. The lures you will use for trout fishing can all be carried in your vest. Many trout anglers prefer to fly fish in streams and rivers. This type of fishing is more technical to learn, but it can be very rewarding. Regular fishing lures are also becoming more popular when wading, soft plastic and hard body lures come in all shapes and sizes, however weed-less or single hooks on soft plastics and spinner-baits are often best when slowing wading down a river, as these have the hook either set in a position where it will not become set in your clothes, or in the case of spinner-baits and traditional soft plastic jig heads, have a single hook making getting them tangled in your vest less of an issue. Lures with treble hooks are very popular and effective too, but it is best to keep them in a small plastic container inside of your vest, not carrying them open where they can dig into the fabric and become a problem to easily retrieve when required. For fly fishing, dry and wet flies can be easily carried in or on your fishing vest. Some vests have areas on the chest portion of the vest to hold flies that you know you will use throughout the day. For those looking for the lightest option for traveling long distances down streams and back through the woods to the vehicle, fly fishing can really be the key. Add to your vest some leader material, something to cut the line with, and a tool to take the hooks out of the fish. This will really complete what you need for your day’s adventure. 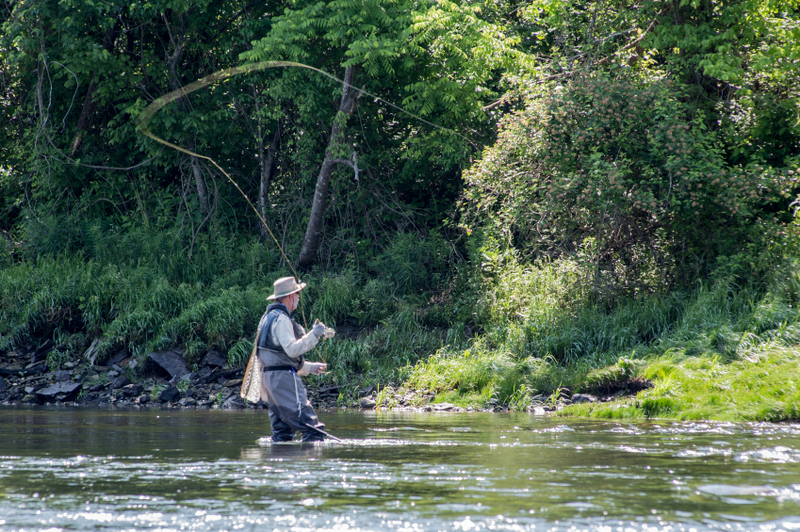 Trout fishing in streams and small rivers can really be a minimalist adventure. You really won’t need much equipment, and what you do need can be carried all day in your vest. Add some bottled water and a snack or two, and you are all set to spend the day catching fish.